For 22-year-old Dragomir, winning the March Player of the Month title was quite a battle. He collected €10,000 Euros in profits throughout the month. The contest came down to Dragomir versus 6maxbottezon (PLO HU) and Alessio Capelli (6-max Elite), who also came close to a €10,000 month. The competition turned into a poker version of a World Wrestling Entertainment battle royale with Dragomir claiming the title. A native of Varna, Bulgaria, Dragomir came out on top after clocking in an amazing 266 hours, the most for any BPC player for the month. The finish did not come easy. 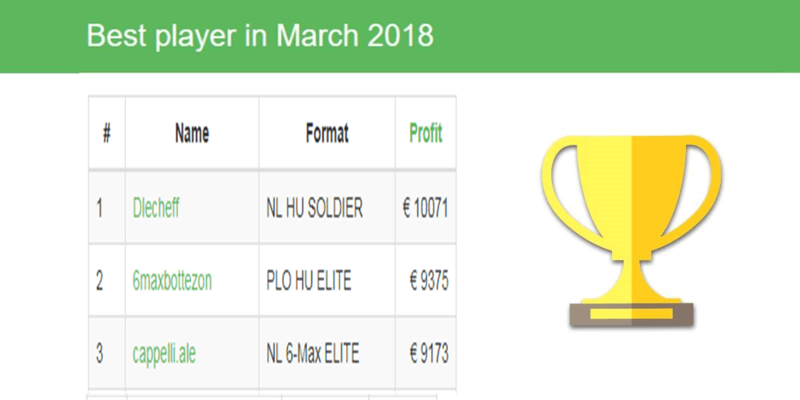 At only around €4,000 in profit, the next four days his profits exploded. “Something happened and I just started making money and reached €10,000,” he says. The feat came with some challenges. Dragmir has been out of town and knew he would have one less day to reach the goal. He was scheduled to fly back home on March 31, so he was going to miss playing that day online. He had to make the €10,000 profit by the 30th. On March 29, he logged 13 hours at the tables and moved his profits to €9,000. After getting a nap at noon, he woke up two and a half hours later and got back to grinding. “I was really pumped up to get the €10k, so I couldn’t sleep a lot,” he says. The battle with 6maxbottezon and Capelli was quite entertaining, but not top of mind when he was putting so many hours at the tables. However, hard work certainly showed results. Discipline is key, this Bulgarian card shark says, in putting in so much time to be successful. He also makes some sacrifices to make his dream of earning a living playing poker a reality, especially when it comes to time in front of his laptop. A former bartender, Dragomir quit his job about eight months ago. He isn’t married and doesn’t have kids, something that allows him to put in even more poker hours. At only age 19 he became fascinated with the game while living in Germany. “I saw a video of one Bulgarian poker player who was making some decent money from poker and I decided that I wanted to do it as well,” he says. He began playing NL2 , 6-max, and two months later realized he needed a coach and joined BPC. In 2016, Dragomir started in the 6-max micro program and in January 2017 he switched to the HU program and now plays NL500. 1. There is still so much to learn because he’s not really as skilled as he would like to be. 2. It gives him the opportunity to make money from anywhere with just his laptop and his poker skills. Committed to winning, Dragomir plays almost everyday – taking only about two or three days off each month. In the past 15 months, he’s had only about two or three months with less than 200 playing hours. Growing up, Dragomir describes himself as a normal kid. At age 18, he realized he didn’t want to work for someone else and didn’t want a boss or regular job. He’s continued to pursue that path with poker. He also enjoys hanging out with friends as well as billiards, volleyball, table tennis, and bowling. However, when Dragomir’s in the groove at the tables, some of this gets put aside. As for poker, Dragomir doesn’t have any huge goals like becoming the best poker player or making millions of dollars. He does have one interesting goal – finding himself up against a certain skilled player (he wouldn’t name him) and having a good run at the table. Other goals include a bit of business interests. In the months ahead, Dragomir is hoping to advance in his skills and believes BPC has played a major role? How has the site helped this young player’s game? With his focus and determination, look for this Bulgarian to be raking in plenty of more Euros. I see you are doing it again this month! GG Dragomir, keep crushing!